Morocco and the EU wrapped up negotiations for a new fisheries deal, which shall include the Sahara waters. The two parties have been negotiating the renewal of the fisheries deal in four rounds of negotiations that came to an end on July 19. The new deal is in line with Morocco’s sovereignty over the Sahara and its waters. Negotiations on the renewal of the Fisheries Partnership Agreement concluded between Morocco and the European Union have resulted in the inclusion of the Moroccan Sahara, a step that strengthens Morocco in its quality as the sole interlocutor liable to negotiate international agreements covering the Sahara, said the Moroccan Foreign Ministry. The renewal of the deal with the Sahara water included deals a heavy blow to the Polisario and its mentor Algeria, which have campaigned for the exclusion of the Sahara from any deal. “The attempts of the opponents of the Kingdom to question this exclusive jurisdiction, have been both disavowed and rejected,” said the ministry, adding that this stage has turned “a new page on the path of overcoming the judicial vicissitudes and vain attacks by third parties”. Throughout the negotiation process, Morocco has been clear and firm on its national fundamentals: the Kingdom has never concluded – and will never conclude – an international agreement that compromises its sovereignty over its southern provinces, said the Ministry. At the end of the negotiations, the two parties agreed that the adaptation of the Fisheries Agreement will be in the form of an Exchange of Letters, including the Moroccan Sahara, the ministry said, adding that the negotiated text expressly mentions that the tariff preferences to Moroccan products also apply, and under the same conditions, to fish caught in the waters of the Moroccan southern provinces. The entry into force of the new deal hinges on the ratification by the European Parliament, although the EU would like a provisional implementation pending ratification. 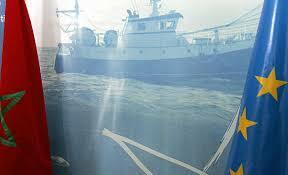 On July 14, EU fishing vessels left Morocco’s territorial waters as the four-year deal expired. Last April, the Council of the European Union has given its green light to the European Commission to open negotiations with Morocco on new fisheries agreement, which includes the Moroccan Sahara. The Moroccan government had then welcomed the decision of the Council of Europe, noting with satisfaction the EU’s coherent approach, in accordance with its internal rules and international legality. About 120 vessels from 11 EU countries (Spain, Portugal, Italy, France, Germany, Lithuania, Latvia, The Netherlands, Ireland, Poland and United Kingdom) operate in Moroccan waters. According to an independent study, the deal not only promotes sustainable development of the fisheries sector through Halieutis strategy projects but also facilitates jobs for Moroccan sailors and fishermen via 1000 boarding contracts per year. Moreover, over 75 pc of the socio-economic benefits of the agreement, such as creation of hundreds of new jobs and improvement of working conditions of tens of thousands of people, are enjoyed by people living in the Southern provinces. Similarly, the gains of the 11 EU countries operating in Moroccan waters largely exceed the €30m EU investment for the support of Moroccan sectoral fisheries policy. Actually, every Euro invested created €2.78 value added for the EU. Posted by Hafid El Fassy on July 21, 2018. Filed under Business, News, Zoom. You can follow any responses to this entry through the RSS 2.0. Both comments and pings are currently closed.